I just came home last week, not that I got a vacation but I have to stay at the hospital from the fever. It’s boring when I couldn’t do anything, just sleeping and eating (and I believe you know the food is not tasty at all). Anyway, I got a magazine from the hospital and I really want to try it (it’s not too old, and it’s great for me to have a food magazine when lying around). 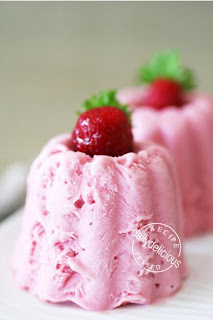 This recipe is Raspberry Ice Cream Bombe, and it’s easy to make even when you just recover (like me), I strain the pit out but if you don’t mind and just blend everything together, this recipe will be super easy. But in my opinion, the pit is annoying and the ice cream is smoother. I reduce the condensed milk from the original recipe, but if you like super sweet ice cream you can use up to 400 ml. 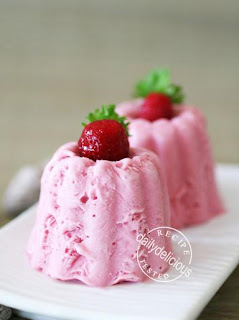 * If you want to remove the pit, use 500g of raspberry and strain to remove the pit before weight. 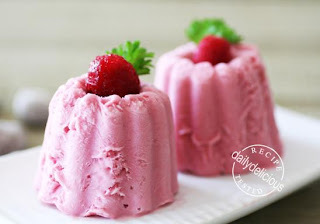 Whizz raspberry in a blender, add the condensed milk and cream and blend to combine. Pour the mixture in to the cup and freeze overnight.